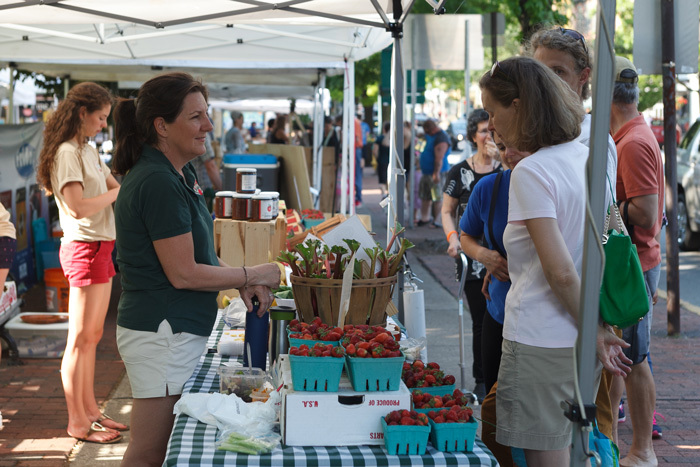 The Carlisle Farmers on the Square market attracts droves of shoppers looking for the freshest locally grown and produced foods. Photo by Carl Socolow '77. Head into any grocery store, and you’ll see that the price of fresh produce often puts up a barrier to healthy eating. Pair that with the fact that 11 percent of Americans are food insecure, which means that they don’t have regular access to nutritious and safe food. So for people who might have to decide between stretching their dollars and eating healthy foods, that barrier might be insurmountable. As a way to make fresh food more accessible for people living in poverty, Carlisle’s Farmers on the Square and food bank Project SHARE offer Fresh Match, a program that allows food benefit recipients to double the value of their dollar benefits when shopping at the Farmers on the Square farmers market. Funding for such programs is often limited, and the summer of 2016 was set to be Fresh Match’s last. So as part of Assistant Professor of Environmental Studies Heather Bedi’s spring Environment and Society class, students studied local poverty, demographics and the farmers market; researched the connection between health and access to fresh food; and wrote grant proposals aimed at obtaining additional funding for Fresh Match. The grant proposal that Farmers on the Square eventually sent to the Highmark Foundation for consideration was developed with the help of the students, Bedi and Cheryl Kremer ’90, Dickinson’s director of academic and foundation relations. And the efforts paid off: Fresh Match was granted $2,000, enough to maintain the program through this summer. Bedi says that learning the complexities of the grant-writing process is invaluable for students, and the knowledge just might be invaluable for the program itself.